Dexter Daily: Michael C. Hall: "I Can't See A Happy Ending For Dexter"
Michael C. Hall: "I Can't See A Happy Ending For Dexter"
Does Dexter’s brush with religion in the new series bring out his spiritual side? "If there’s a God in Dexter’s world, I suppose it’s arguably Harry or the code or Dexter himself, taking God’s work into his own hands in as much as he’s ending people’s lives. A broader sense of what God might be isn’t something he has faced until now." The Doomsday Killers and Brother Sam represent a pretty broad spectrum of faith, don’t they? "There’s a very negative manifestation of religious states, with these killers who are basing their heinous acts on scripture, and then we see Dexter enter into as authentic a friendship as he’s ever had with Brother Sam, who has been rehabilitated through the redemptive power of faith. So you see the shadow and the light side." 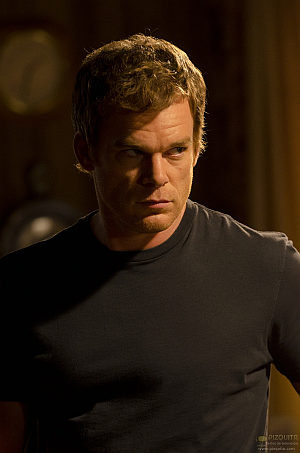 Have you been surprised by what’s happened in Dexter’s life over the course of five series? What do you think has been the most significant change in him? "He has experienced a genuine sense of connection to his son, who wasn’t in the world at the beginning of the show. The biggest change has been that he’s seen his behaviour affecting more than just him. It’s resulted in the death of Rita, the things his son has witnessed, and a lot of confusion for his sister. His claim that he is without a capacity for humanity has kind of been blown out of the water." Would you like to appear in a show that doesn’t revolve around death? "Actually, it’s in my mission statement as an actor that I must always be surrounded by dead bodies! Seriously though, yes, I’d love to do a comedy where nobody died." What about getting back to the singing and dancing of your Broadway career? "I would love to find a chance to do that again, but I’m not sad that Dexter hasn’t gotten the chance to showcase it. I don’t think it’s quite the proper vehicle, and I doubt we’re going to see a musical episode of this show." Do you worry that people will think of you as Dexter for the rest of your career? "I’m aware that there’s an inevitable residue of Dexter that will be on me. But at the same time, when Six Feet Under was on everybody thought I was a gay funeral director. I guess David Fisher was Dexter’s first victim." "That has happened, and I’ve been amazed by some of the people who have said it, though usually it’s after a few drinks at a party. The calibre and variety of actors we’re able to get to take part in our crazy little world is a real shot in the arm." With a seventh and eighth series in the pipeline, how do you see things panning out? "I think once again I’ll be challenged to incorporate some very new and powerful dynamics into Dexter’s world. To be honest, it’s difficult for me to foresee an entirely happy ending for the character." I agree. It is hard to see a totally happy ending for Dexter, but it isn't impossible for him to have a bittersweet ending. However, the show is very cyclical--it might end with Dexter teaching Harrison the code, or myriad of other ideas that have been forth in the first six seasons of the show. But, I am hoping for a revival since the last two seasons have not been the strongest. Hopefully with some consistency in the show-runner chair, they can bang out another good season. Fans would love to see Dex float off into the sunset with his son. The novels have Dex teaching Rita's kids Harry's "code." Since that may not be possible, I don't know if I can see Dex teaching Harrison in just the next 2 seasons. There are a few loose ends that might come back to haunt him. All that said, I can't wait to watch. The perfect end for the series would have been the end of season 5 (except for those last 10 minutes which ruined the entire season). Quinn is to naive. Quinn knew Liddy was following Dexter Morgan around. Liddy calls Quinn to make the big bust. Liddy somehow ends up dead immediately after this. Dexter clearing the fresh blood on Quinns shoe should have produced suspicion in Quinn about Dexter. Quinn would have known that the fresh blood on his shoe was probably standing outside the Van that Liddy was killed in. Quinn is a smart detective. Quinn should have been able to put Liddy's death together.